Happy New Year! One of my resolutions for 2013 is to cook more and to post more to MichDish. What better way to start with a post from new year’s eve dinner last night! So… cookbooks are one of my favorite things. Even if I never make any of the recipes the pictures and flavor combinations are just inspiring on their own. This year one of the cookbooks I received was Plenty. The photography is just beautiful and everything looks amazing, so when I was in charge of a vegetable side dish for our annual fancy new year’s eve dinner, I decided to turn to the cover recipe. 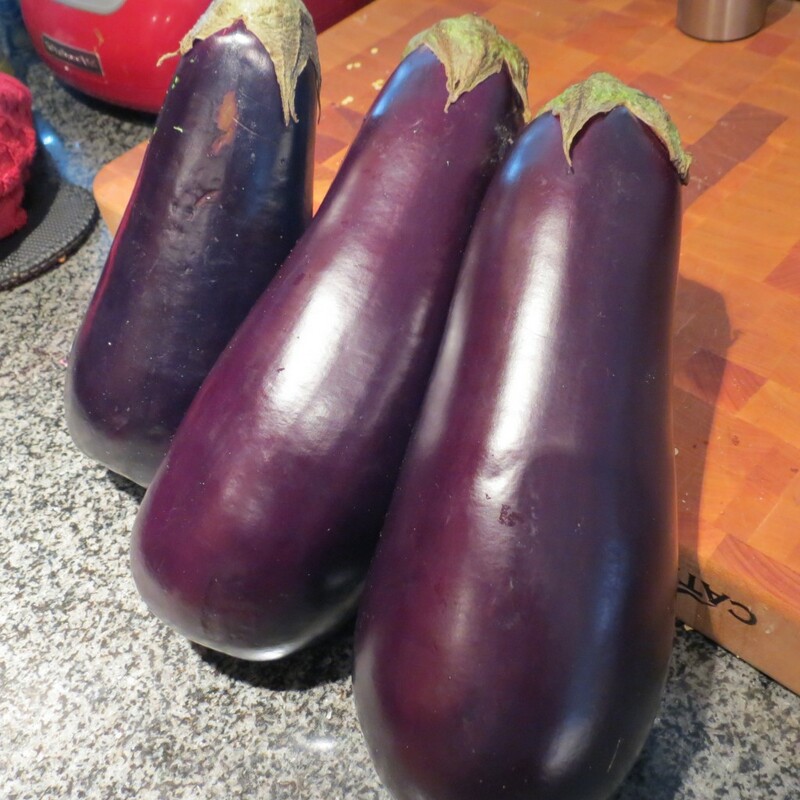 Disclaimer: I generally do not like eggplant. I find it way too oily or have an issue with texture. The eggplant with buttermilk sauce that was on the cover of this cookbook though is just so inviting I couldn’t not make it. As it turns out the recipe was super simple, a breeze to prepare in advance and bring to the dinner, and so beautiful and festive looking. Not to mention pretty delicious! So here’s what you’ll need to serve 6 (or depending on how large the meal is… to serve 24). Preheat your oven to 400 degrees and line 2 baking sheets with tin foil. 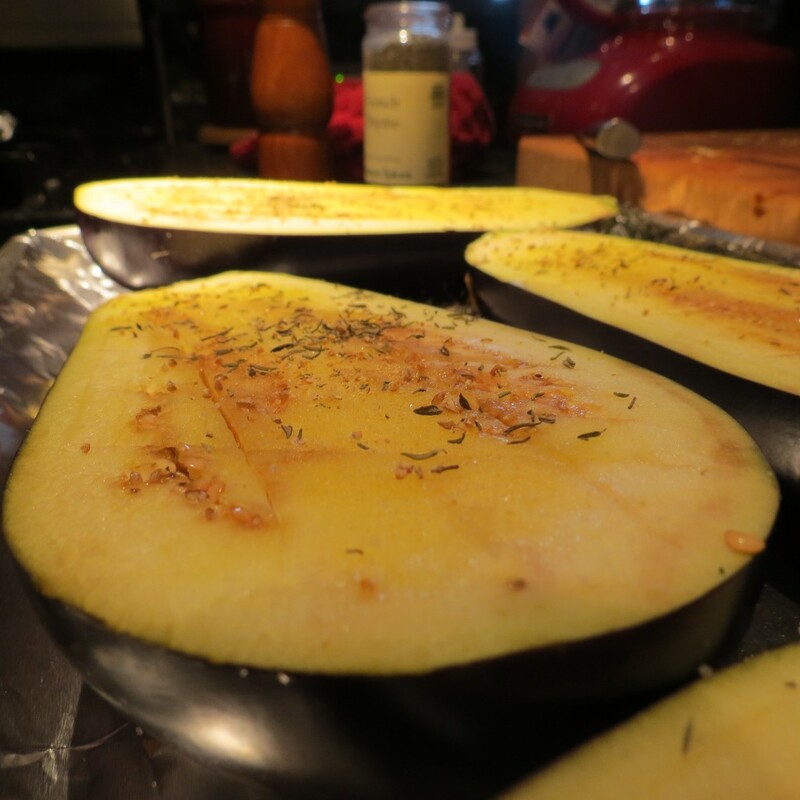 Slice eggplants in half lengthwise, cutting through the stem (for pretty presentation). Using a sharp knife make 3-4 parallel incisions on the inside flesh of each eggplant from stem to base, being careful to not puncture the outer skin. 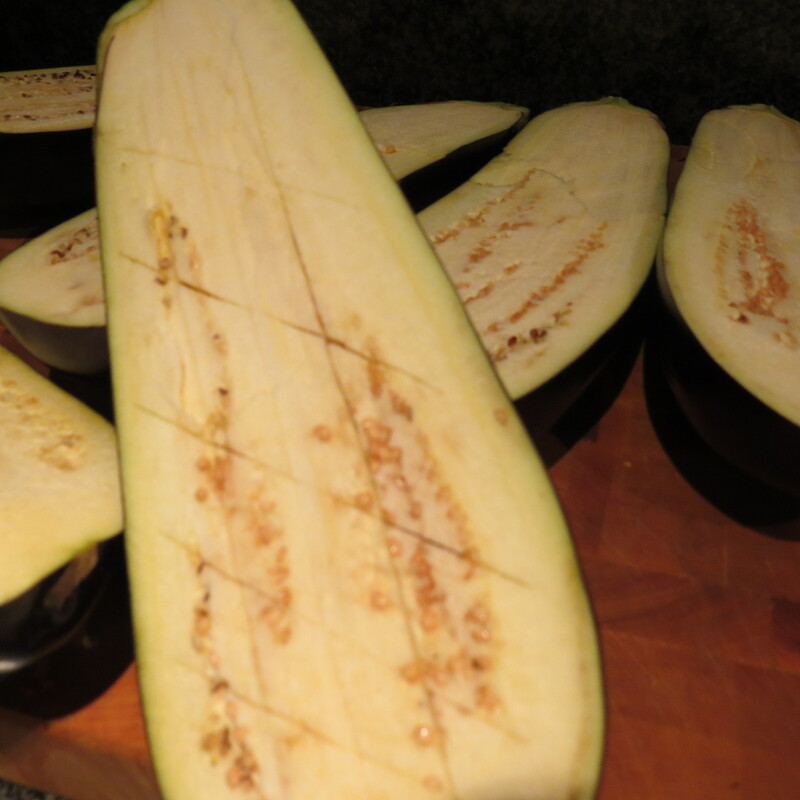 Then make several diagonal cross cuts to create diamond patterns in the eggplant. With a pastry brush evenly distribute the olive oil on the flesh of the eggplants and then sprinkle with thyme, garlic salt, and cracked pepper (you can use other pepper, but there’s something so rustic and chef-y about taking out your pepper grinder). 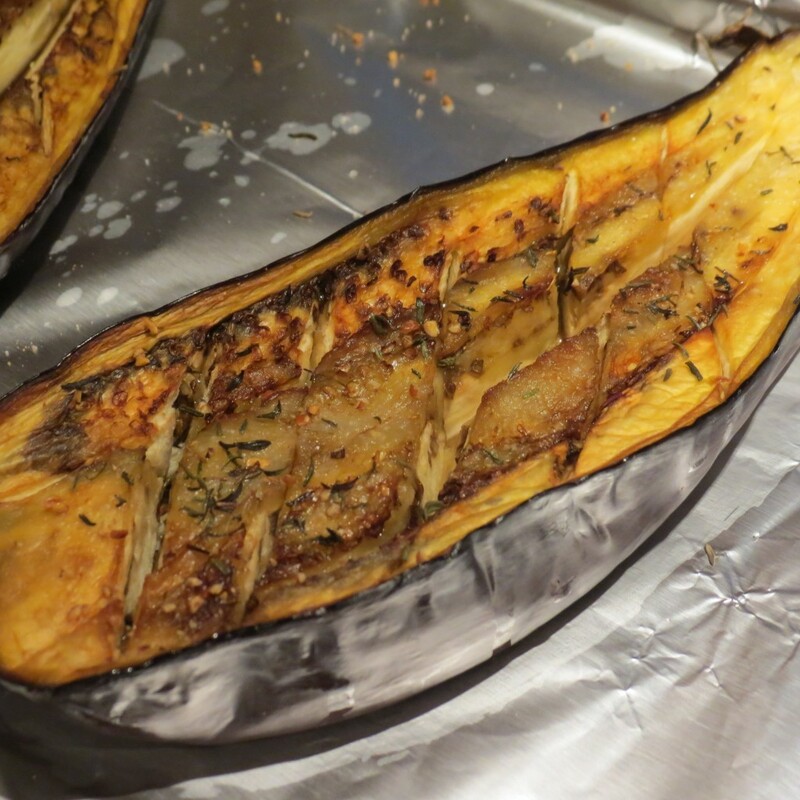 Roast eggplant for 40-50 minutes. If you have 2 baking sheets that don’t fit on the same rack, rotate them half way through the cooking. Remove from oven and allow to cool completely. 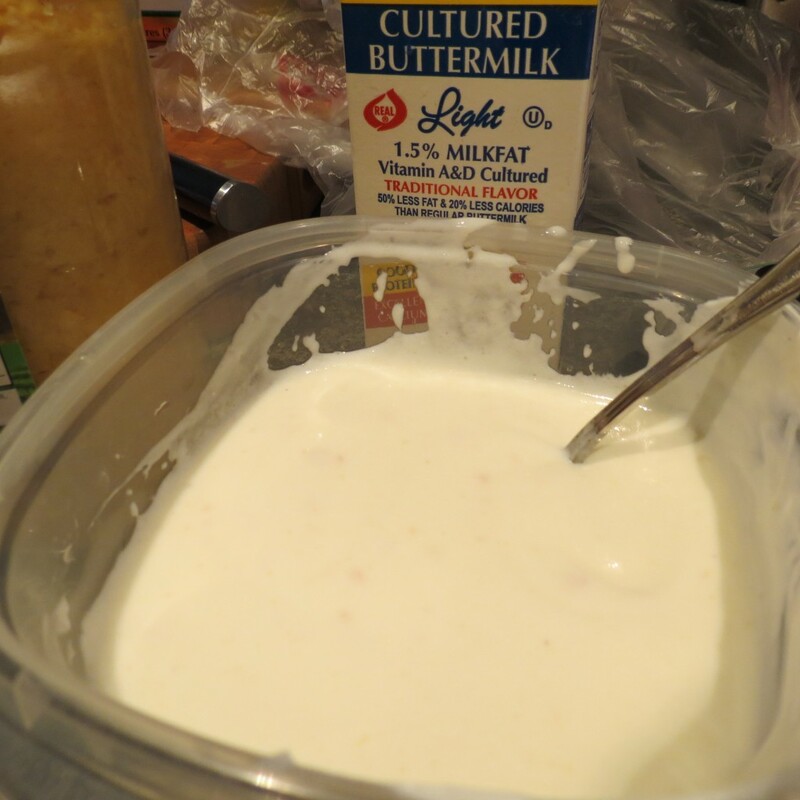 To make the buttermilk sauce, combine 1 cup fat free Greek yogurt (you could use whatever type you like though, i just like the fat free one), 1 cup plus 2 Tablespoons light buttermilk (again, use whichever type you prefer), 2 cloves crushed garlic, 2 Tablespoons olive oil, garlic salt to taste. Refrigerate until ready to serve. The next thing you have to prepare is the pomegranate. 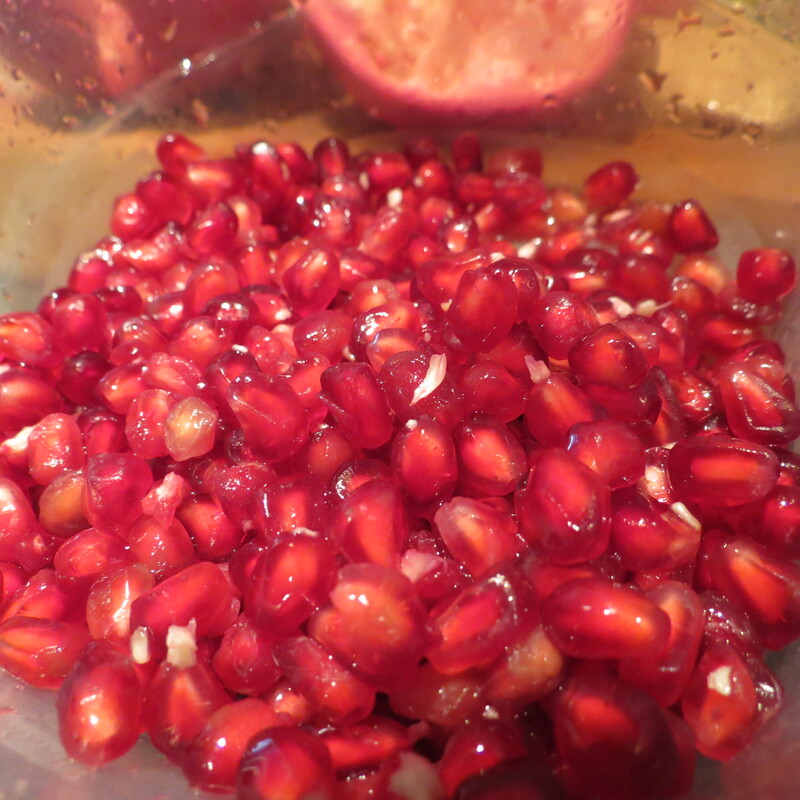 If you don’t know how to get the seeds out of a pomegranate without making TOO much of a mess, it’s simple! Cut the pomegranate in half and hold it in your hand, seeds facing your palm over a bowl. 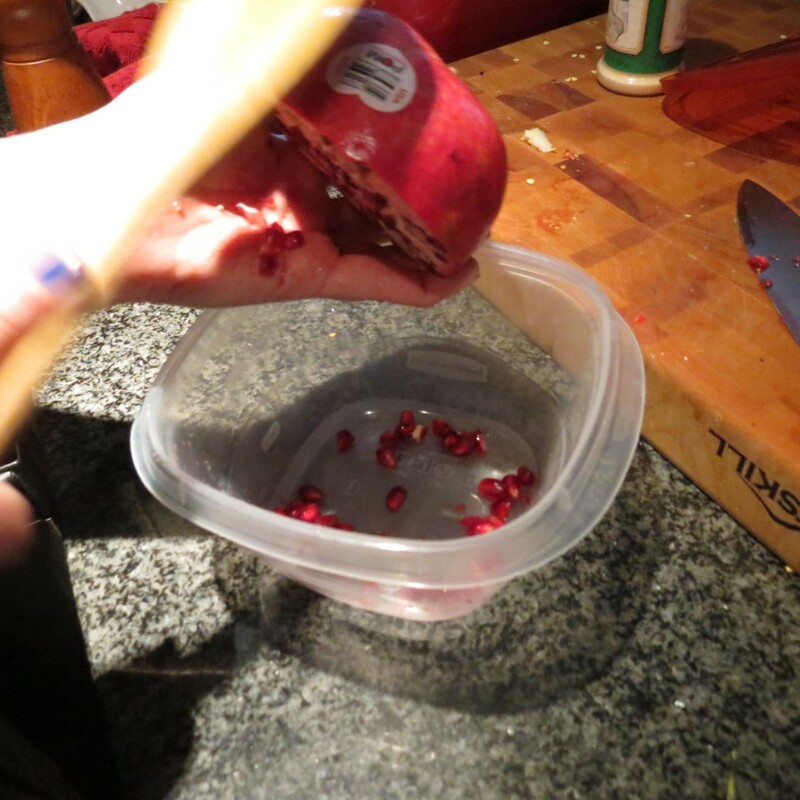 With a wooden spoon, smack the pomegranate and the seeds will fall through your fingers into the bowl. It’s a great way to take out frustration. The recipe also calls for za’atar which is a middle eastern spice blend. The grocery stores in Hoboken do not sell this, but a specialty food shop would. Or you could make your own like I did with this helpful recipe! I must say, the toasted sesame seeds being ground up give off the BEST aroma! So, now that you have all the components comes the fun part: presentation! 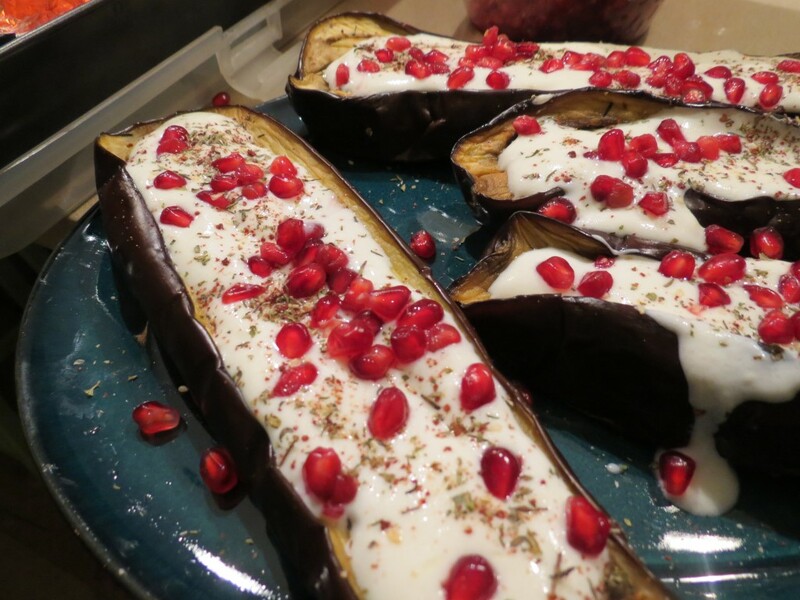 To assemble, arrange the eggplant halves on a platter, coat generously with the buttermilk sauce (you will have a lot to spare, so don’t be shy! 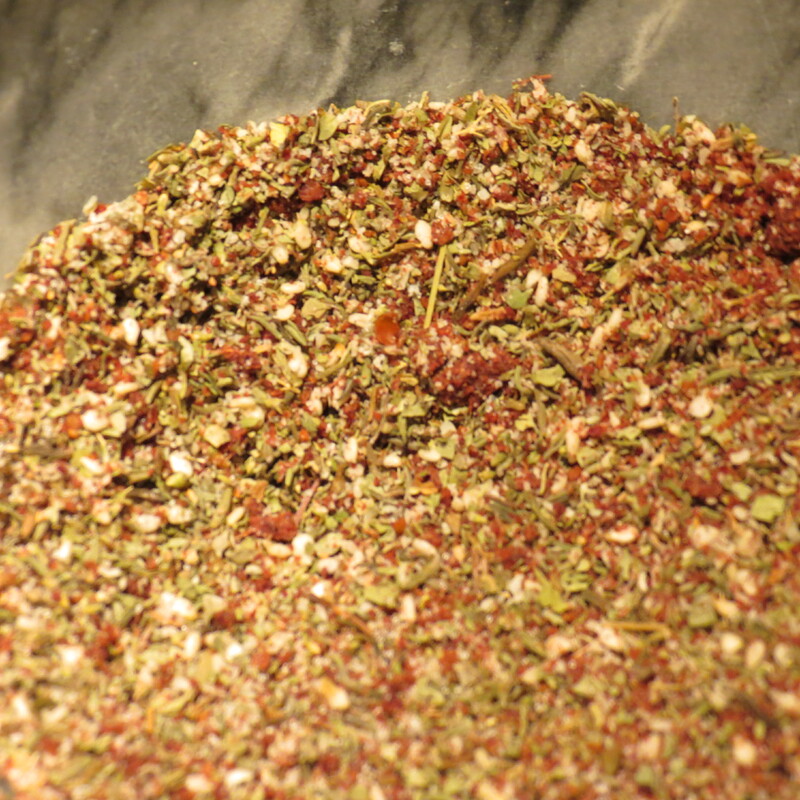 ), sprinkle with za’atar and top with pomegranate seeds. It looks so festive and elegant. Happy New Year!